The requirements in industrial image processing impose great demands of the optics, not only to the optical performance of the lenses used, but also to their mechanical design. High vibration stability is one of the requests which is not often fulfilled by conventional C-Mount lenses available on the market because of their light construction. In addition, the lenses need to be robust, small in size and should have a locking mechanism for both iris and focus. 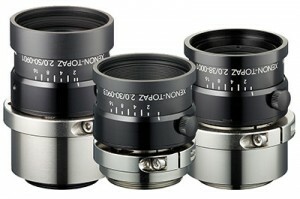 The new Xenon-Topaz Series manufactured by Schneider Optics, designed for 12MP, 1.1” sensors (a 17.6mm diagonal), provides all of these features in an affordable package. The Topaz family of lenses are optimized for working distances ranging from 1m to infinity, and are able to resolve pixels as small as 3.0µm. The employ a broadband coating that allows transmission from 400nm to 1000nm, and come in three different focal lengths: 30mm, 38mm, and 50mm. These lenses are ideal for a wide variety of applications, including Traffic Control, Surveillance Systems, Robotics, and Machine Vison.